Healthy Strawberry Banana Popsicle Recipe — When it Rains Paper Co. | Colorful and fun paper goods, office supplies, and personalized gifts. FACT: Kat and I love sweets. We pretty much have a 24/7, nonstop, give me all the sugar, sweet tooth. We try really hard to allow ourselves only one true dessert a week because as much and I love sweets, my hips don't. (Blast them.) Over the years we have forced ourselves to come up with some healthy alternatives to hold us over until our Saturday indulge. Frozen fruit treats seem to be one of our go-tos. 1) It's a great way to get a serving of fruit. 2) We can make big batches all at one time and enjoy for a few months and 3) Eating frozen treats last longer than that 2 bite piece of sugar-free WW candy that doesn't even taste that good to begin with. I have always wanted to try homemade popsicles because the possibilities seem endless! Per usual, Kat and I find about 50 different recipes on Pinterest and then form some combination of ingredients based off of what we usually keep in stock and what our taste preferences are. We prefer to keep our ingredients as healthy as possible, but also as simple as possible. If it calls for something weird that we can only get at select health food stores - that's gonna be a no. We will find a substitute. 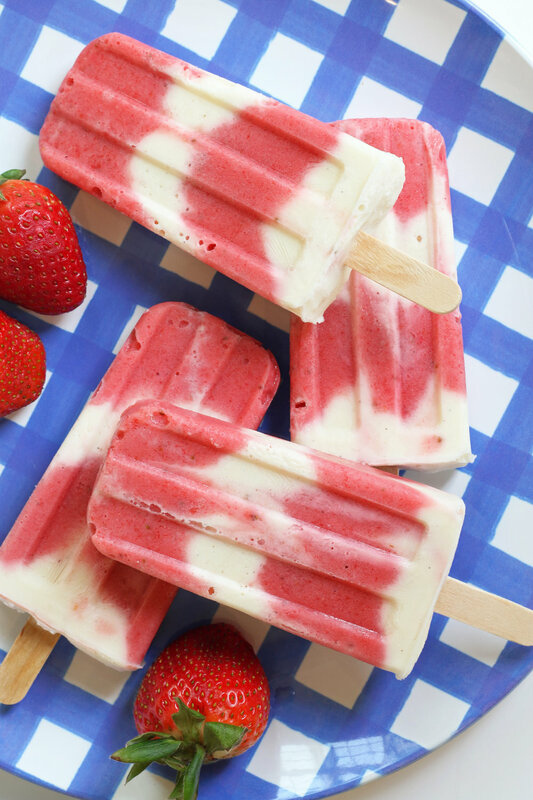 That brings us to these strawberry banana popsicles we made this week. I'm here to report that these are easy to make, healthier than our usual Ben and Jerry's Tonight Dough, and DELISH. Step 1 | Combine yogurt, honey, and vanilla extract. Blend well and set aside. Step 2 | In a blender, combine strawberries and bananas. Add Truvia by the pinch-full until the fruit blend is sweet enough to your liking. We probably added a teaspoon to ours but we tend to like things just a bit sweeter. Step 3 | Layer the fruit puree and yogurt blend into your popsicle molds until all of them are full. (I used this popsicle mold from Amazon.) Place lid on mold and insert popsicle sticks. Freeze overnight. Step 4 | To release popsicles from the mold, I filled up our sink with luke warm (not hot) water and placed the mold in the water for about 20 seconds. They released super easily and we individually bagged them in snack size ziplock bags. Enjoy! Let us know if you try the recipe or if you come up with a good flavor combination of your own! Looking for other healthy dessert alternatives? Be sure to checkout our peanut butter banana ice cream, sparkling strawberry slushie, and this blueberry cheesecake protein shake!